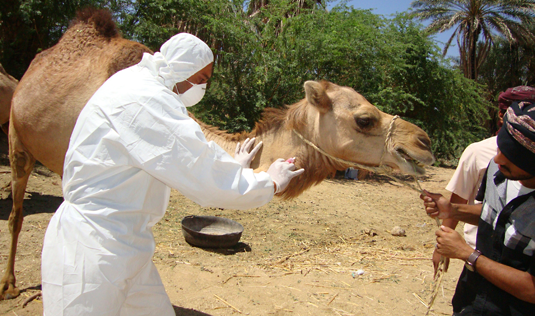 A German-Dutch team has succeeded in immunizing dromedaries against the MERS virus. As the camels appear to be the major reservoir of the virus, the vaccine should also reduce the risk of future outbreaks of the disease in humans. The recently discovered coronavirus now referred to as MERS (for Middle East Respiratory Syndrome) causes an infectious respiratory disease in humans, which can be fatal. The virus is thought to be transmitted to humans primarily via contact with dromedary camels. 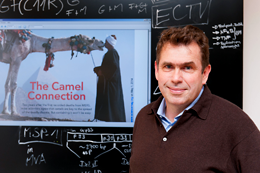 Now researchers led by virologist Gerd Sutter at LMU Munich, in collaboration with teams led by Professor Bart L. Haagmans of the Erasmus Medical Center (MC) in Rotterdam and Professor Albert Osterhaus of University of Veterinary Medicine Hannover, Foundation (TiHo), have successfully tested a candidate vaccine against MERS, in camels. “We have been able to show, for the first time, that our vaccine can significantly reduce the virus load in infected camels,” says Sutter. The results of the trial appear in the latest issue of the journal “Science”. Gerd Sutter, who holds the Chair of Virology in the Faculty of Veterinary Medicine at LMU, is currently engaged on a project designed to qualify the candidate vaccine MVA-MERS-S developed in his laboratory for use in clinical trials in humans. As yet, there is no vaccine available that can protect humans from infection by the MERS virus. The new vaccine, MVA-MERS-S, was developed by Sutter and his team two years ago. In cooperation with researchers based at Philipps University in Marburg and the team in Rotterdam, he introduced a gene for the so-called spike protein of MERS into the genome of a weakened strain of poxvirus (MVA). The resulting modified poxvirus particles expressed the MERS protein on the surface of infected cells, and these engineered viruses form the basis of the new vaccine. Several preliminary data over the past two years have confirmed the immunogenicity and efficacy of MVA-MERS-S in mice. The scientists now describe the outcome of the first direct test of the vaccine in camels. The MERS virus was first identified in Saudi Arabia in 2012. To date, some 1400 cases of MERS have been reported, of which one-third proved fatal. Its primary hosts, however, are dromedary camels, as revealed by the detection of antiviral antibodies and the presence of MERS particles in the nasal cavity in infected animals. Although camels infected with the virus show relatively mild symptoms, all the evidence suggests that they can transmit the pathogen to humans, who can subsequently pass it on to others. Hence, vaccination of camels against MERS virus is an obvious method of choice for the prevention of human infections. Successful immunization would deprive the virus of its primary host and break the chain of transmission, effectively minimizing the risk of future MERS epidemics in human populations. But the vaccine from Sutter’s laboratory actually turns out to another advantage: “Immunization with MVA-MERS-S simultaneously protects camels from camelpox, a disease similar to smallpox in humans – which can be life-threatening in dromedaries,” Bart L. Haagmans of the Erasmus Medical Center explains. In camels infected with the MERS virus, symptoms of disease are confined to the upper respiratory tract. In the new study, the researchers infected a total of 8 camels. Half of these had been immunized, both intranasally and intramuscularly, with MVA-MERS-S three weeks prior to exposure to the virus. “In this group of animals, the vaccine had induced the development of sufficient amounts of antibodies to inhibit viral multiplication and prevent the appearance of disease symptoms upon infection,” says Dr. Asisa Volz, a member of Prof. Sutter’s group. In addition, anti-MERS antibodies were detected in both the nasal mucosa and in the bloodstream of immunized animals. The controls, on the other hand, which were injected with poxviruses particles lacking the S protein, exhibited the typical runny nose, and infectious virus was readily detectable in nasal secretions. “Our results clearly show that vaccination with MVA-MERS-S markedly reduces the numbers of viruses present in the nasal epithelia of camels,” says Albert Osterhaus of University of Veterinary Medicine Hannover. MVA-MERS-S can, of course, also be used to immunize humans. Indeed, thanks to the tests carried out so far, the vaccine already meets many of the most important preconditions that must be fulfilled prior to its use in clinical trials in humans. Gerd Sutter is currently leading a project entitled “GMP manufacture and Phase I clinical investigation of MVA-MERS-S, an experimental prophylactic vaccine against the Middle East Respiratory Virus Syndrome” at the German Center for Infection Research, which is designed to set the scene for the first such tests of the vaccine in humans. So far, there are no candidate vaccines available that could be used in the event of a large-scale epidemic. Only a few months ago, in the early summer of 2015, more than 180 people were infected with MERS in South Korea. The origin of the outbreak was traced to a single carrier, who had recently returned from the Middle East. All confirmed infections in humans have so far been linked, directly or indirectly, to that part of the world, hence the name Middle East Respiratory Syndrome Coronavirus (MERS-CoV) for the pathogen responsible. Three cases of MERS have been recorded in Germany. All three patients had recently visited Saudi Arabia, and had contracted the disease there.